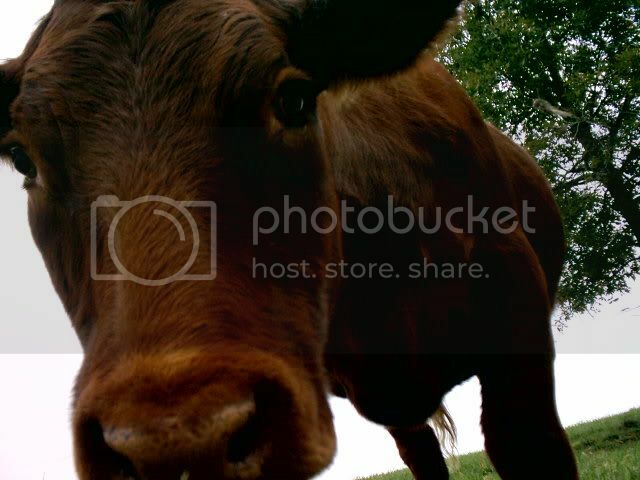 I was lying in the pasture taking pictures of my dog, and one of our cows got really curious. LOL. Probably wanted the address of "contended bull" down the forum a way. something similar happened to my friends on a hot muggy moonlit nite in montana years ago.they'd quit their jobs out east and decided to camp their way across the country and see some sights. well, they drove late, found a nice quiet place to set up the tent and rolled in with the flap open to catch any passing breeze. When my now 30y/old son was about 13 he had a cow, I don't know what breed though. It was gray and the guy who sold it to us said it was some sort of dwarf? It was very young...or however it's called? He kept it for about three years and of course it didn't grow:-). I've been meaning to check it out online..I have some pics somewhere, I want to scan them and show them here 'cause I'm sure you all know the breed. He sold it because school sports were taking too much time away from the feedings, and at the time he also had chickens, rabbits and some goats. You're braver than I--with cows. I don't trust them that much, pet cows or not. I brightened up the picture so I could see it on my computer better. Cute picture. Mark H.
I like that picture! Nothing like a Nosey Cow getting a lick in. Mark H.
And should have closed your eyes...... A long raspy tongue couls surely bring ya back to reality. I can relate to this snap. (grin) Wonderful!!! Just how tall is that bovine? Or is it you're on the shorter end of the human height spectrum?! I was lying on the ground, then sat up to take the picture. She is a pretty darned big cow though: 1/2 Limousin, 1/4 Shorthorn, 1/4 Angus. The Limousin really shows in her, but she has the wonderful Shorthorn mothering ability. Sounds like the perfect combo to be a good calfer! the part limosine is that a gm or ford prodoct ? Oh yeah Cows are one of the nosiest animals..